Believe it or not, studies have shown that of all the features on the face, eyebrows are actually the most important. Eyebrows are our most recognized feature, they affect our day-to-day grooming routines and, perhaps most importantly, help us convey emotions. According to Taquisha Jallah, owner of Bladed by Hair Love, a set of well-groomed eyebrows can also give you a confidence boost. Jallah first launched as a hair extensions provider but has since expanded into semi-permanent makeup services. 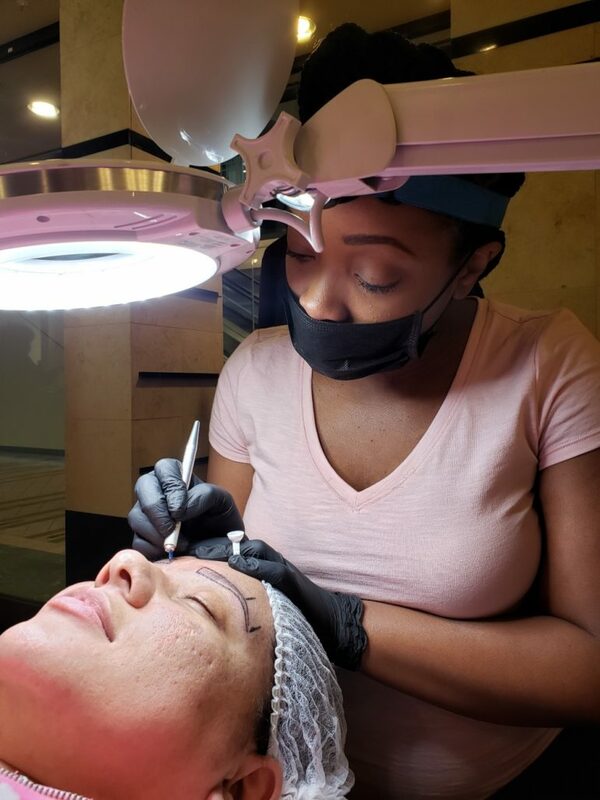 Now, she helps her customers get their eyebrows in “formation” with microblading, a tattooing technique for eyebrows. She consults, shapes and etches in brows for clients who want thicker, fuller (or just some) eyebrows. And, with changing brow trends, it’s good to know the ink isn’t permanent, fading within 12-18 months. Here, the MSR chats with Jallah about the inspiration behind her newest venture and the difference a good brow can make. MSR: You do both microblading and microshading? What’s the difference? Taquisha Jallah: Microblading, specifically, is the hair-like stroke. Microshading is more of the filling in of the brow — like when you fill in your brow with an eyebrow pencil. It’s more of a makeup-y look. And, microblading is the most natural service. 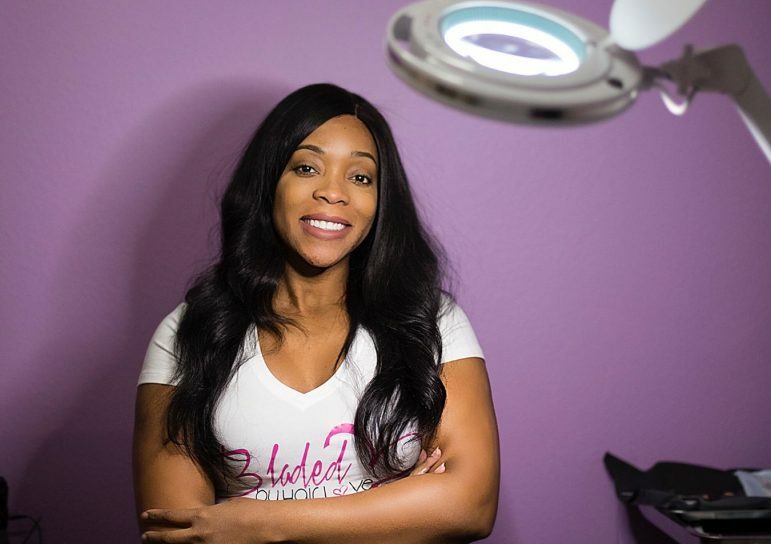 MSR: What inspired you to expand your business into microblading? TJ: I’m always thinking of new creative ideas and niches to innovate my brand and myself. What really inspired me was knowing that it really wasn’t a big thing up here in Minnesota, yet — at least not within our [Black] community. It was a good way to transition out of just selling hair and into a new lane that hasn’t really been tapped into up here like that. MSR: How long did it take you to learn that process? TJ: Initially, I went to a socialite on Instagram who was teaching classes in Chicago. That was just a one day, eight-hour class and then I was a certified by her. When I came back to Minnesota, I had to learn all the legal state regulations and laws that went along with it. I found out that I needed to do an apprenticeship — 200 hours under a licensed tattoo artist or body art technician. I found someone who [fit the criteria], was teaching classes, and had an opening for apprentices. She said what I had learned [from my certification] was not up to par and helped me level up. Then I got licensed with the state of Minnesota. MSR: What makes your services stand out? TJ: I’m certified and licensed. I’ve noticed some girls who have started doing the microshading. Their price may be dramatically cheaper, but in a lot of cases, they’re not licensed by Minnesota. They only have that certification portion of it and they [often] don’t have their own private studio. I have my own little private suite in Maple Grove. Also, I think my price as compared to others is pretty reasonable — even on the cheaper side. MSR: What’s your vision and goal? What does success look like? TJ: I want to start off teaching more women who look like me this craft so we can become more of the service providers and not always [the ones] getting services. We’re like the number one buyers [of beauty] as Black women, so, why aren’t we getting a profit of some of that? Eventually, I really want to open or build my own [version] of Salon Concepts or a Salon by JC’s building that has nail techs, eyelash techs, and microbladers all housed under one roof that’s professional and can be a reputable place to go. MSR: What is the biggest challenge in running your own business? TJ: Honestly, it’s just getting others to believe in me — people who aren’t necessarily friends or family — getting them to understand what it is that I’m doing, the value, the need for what I’m doing and then trusting me to provide that service for them. MSR: What’s been the most rewarding part? TJ: The reaction from my clients, the internal feeling that it gives me. When I started doing this, my dad, who has alopecia, was like, “can you draw me on some brows?” He’s never asked me for anything, but for me to give him some eyebrows after 30-plus years of suffering from alopecia, that’s full circle right there. MSR: How do you see your business and services impacting the community? TJ: It’s not just about beautification, but also taking back that power. Black people are always the consumer. Why can’t we be the owner? Why can’t we be the service provider? Why are we spending our dollars elsewhere? Back in the day, the Black dollar used to circulate within the community 10, 11, 20 times. Now, it’s like 30 minutes. We can train each other up, get educated and provide these services for not only ourselves but other people, too, and help keep our dollars in our communities longer. MSR: What’s one thing you wish you knew before launching your business? TJ: That everybody doesn’t want to see you win. They could be right there in your own camp — and not want to see you eat. It’s like only one person can excel in a certain industry. No — we all can all eat; we all can sit at the table. And, when we collaborate and come together, we can reach more ground. Bladed By Hair Love is located at 7860 Vinewood Ln N #29 in Maple Grove. For info, call 612-568-3499. First-time MSR readers who book through April 30 will receive $50 off any service.